We are told that this is a new world, with which old theories cannot cope. But the dynamic driving the current global transformation is not as new as our pundits and politicians pretend. The global market-place of our day may have little in common with the tamed welfare capitalism of the post-war period but it is uncannily reminiscent of the untamed capitalism of 100 years ago. Keynes and Beveridge may be dead, but Marx, Malthus and Ricardo have had a new lease of life. 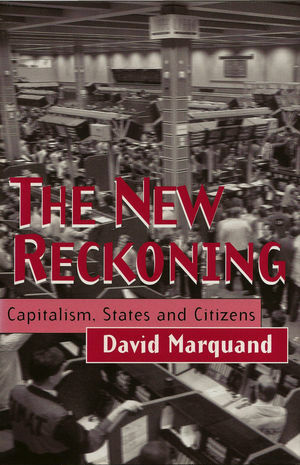 In these timely essays, David Marquand challenges the fashionable amnesia of the 1990s and addresses the crucial questions raised by the capitalist renaissance which has followed the collapse of Communism and the end of the cold war. In this bewildering new world, which is at the same time an all-too-familiar old world, how can the values of social solidarity and democratic citizenship be realized? Granted that socialism is no longer with us, does it have anything to say from beyond the grave? How is socialism's great antagonist, liberalism, faring in this new world, and what are the prospects of an accommodation between the two? Where does the new medievalism of contemporary Europe fit in? How do the special peculiarities of the British state, the identity it embodies and the political economy over which it presides relate to those wider issues? What room for maneuver do they give the British left? These questions make up the agenda for The New Reckoning. David Marquand is Principal of Mansfield College, Oxford and Honorary Professor of Politics at the University of Sheffield. 1. Journey to an Unknown Destination. Part I: Capitalism, Socialism and Citizenship:. 4. Liberalism's Revenge? Resolving the Progressive Dilemma. 5. The Politics of Monetary Union. 9. The Enterprise Culture: Old Wine in New Bottles?. 10. Henry Dubb versus Sceptred Awe. 11. Collaborative Capitalism and Constitutional Reform. 12. Travels of an Ancien Régime. * This is a major new book by one of Britain's foremost political commentators. * The volume offers a comprehensive re-interpretation of British politics from the Second World War to the present. *Marquand poses sharp dilemmas and new questions for our politicians faced with the extension of capitalism on a transnational basis. The development of global financial markets threatens to undermine the basis of citizenship and welfare. In exploring how this can be checked, Marquand sets out a bold new programme of principels and institutions for the re-regulation and accountability of capitalist organizations, and of our public life more generally.